When he was questioned by police for not wearing a seat belt, a 19-year-old man became abusive to them and was arrested, Craigavon Magistrates Court has heard. Tiernan Cavanagh, Georges Island, Road, Craigavon, was fined £200 for disorderly behaviour on July 28 this year. 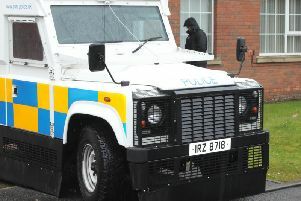 The court heard that at around 11.30pm, police saw a car at Wesley Place car park in Lurgan and noticed that the two males in the back seat were not wearing seatbelts. When they saw police they scrambled to put them on. After police had finished with them the driver put them out of the car and Cavanaghstarted swearing as police carried out checks on the other person. He also called an officer the ‘C’ word. Both of them were intoxicated. A defence barrister said Cavanagh had become a little irate and he should have kept his mouth shut. District Judge, Mrs Bernie Kelly, told the defendant that he was appearing too regularly in court for ‘basically what is stupid behaviour’ and if he kept on like this he would end up in custody.